Will Hutchins tells stories about revisting Warner Bros. studio. Howdy! Let’s march back inside the hallowed walls of Warner Bros.! Yes folkd, you can go home again. I did, back in the ‘80s. Babs and I drove up to the side gate—Pop the cop peered in. “Sugarfoot, is that you?” I allowed as how it was. “Well, did you ever learn to ride a horse? Heh heh.” We passed on through. I was ushered into Francis Ford Coppola Jr.’s office to see about a part in a flick. Feelin’ finer than frog hair, I loosened up the proceedings with a tad o’ Japery. Had ‘em yakkin’ pretty good. All but two: the casting lady and Mr. Jr. Hi-Ho and so it goes. I guided Babs wayyy out back to show her the famous Western street—Where was it? Gone with the wind. Life isn’t fair. I showed her the steps where Jimmy Cagney got his in “The Roaring Twenties”. Remember? 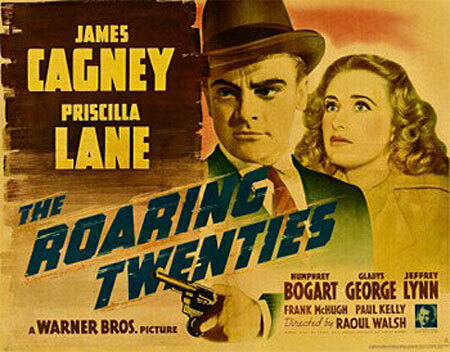 Cagney, gat hip high, blasts away with body English, and Bogie takes the fall. Cagney runs out onto the Warner New York Street. Amid a hail of bullets he staggers up the church steps. He collapses, too late for confession. Gladys George rushes to him. “Eddie Bartlett—he’s dead,” she tells a cop. “What was his business?” he says. “He used to be a big shot,” she says. Camera pulls back to a tableau. Cagney sprawled in Gladys George’s cradling arms. Cop dutifully writing in his notepad. What? “Eddie Bartlett, deceased, former big shot”? The end. “Melancholy Baby” swells up for the exit. Ah, the Cag—stocky, staccato, volatile, versatile. He could do it all, from Shakespeare to Westerns, from gangsters to song and dance man. I remember my first movie, Laurel and Hardy in “Babes in Toyland”. Two crazy guys asleep, snoring, blowing a feather into the air, back and forth. Bedroom badminton. I thought the two guys were actually on the stage, behind the screen. I was hooked for life. I wanted to be a funny guy. Then, I saw my first Western. How did they get that cowboy on horseback, atop a mountain, overlooking a lake, inside the back of the theatre? Wow! The horse and rider dove into the lake—SPLASH! Yee Hawww! I wanted to be a cowboy. The cowboy was a stuntman—stunt people are the backbone of all the action thrillers, computer graphics notwithstanding. They give out Oscars for art direction, cinematography, costumes, makeup, sound, editing, songs (bet next day you can’t whistle ‘em)—but you won’t get an Oscar if you light yourself on fire and tuck ‘n roll out of a speeding car. Why not? Maybe the Academy wants to promote the illusion that actors do their own stunts. Hutch’s Law: During a stunt, if you don’t see the actor’s face, a stunt person is performing it. Stunt people are dedicated artists, highly skilled athletes, working with split-second precision. Hail Roydon Clark, Acey and Bear Hudkins, Jocko Mahoney, Lane Bradford, Neil Summers! An honor working with them. Next year on the Oscars, instead of a dance routine, let’s see a rock ‘em sock ‘em bar room brawl—the dance hall girls revolt and beat up management, low pay, harassment, the piano player’s drunk—then, at longgg last, Oscars for best stuntwoman and stuntman. Then, this brave gal and gent must face their greatest fear: making acceptance speeches. In Atwater, during the ‘30s, stuntmen of the Saturday matinee serials were our heroes. After the show we’d hop onto our trusty Schwinns and ride yonder, helmetless, to Griffith Park and practice our rough ‘n’ tumble. ‘Twas the Depression. Money was scarce, but we had our priceless imaginations. The times were fraught with peril, but here we are. We made it. No seatbelts nor air bags. We drank water from the garden hose and lawn sprinklers. Trees were our monkey bars. We’d climb to the top to see as far as we could see. We’d walk our bikes up high to the Observatory. We’d glide back down, lickety split, brakes be damned. We’d play all day. At night we’d play kick the can in the street. Cars where slower then. We’d dodge ‘em. BB guns, firecrackers, sticks and stones—we got cut, broke bones and teeth—no lawsuits, our fault. Moms warned us not to take candy from strangers. There were no strangers in Atwater. No crime. (Now, windows are barred there. Awhile ago, seven people were murdered there.) We ate and drank what pleased us. We kept in shape, playing outdoors. No TV, cell phones, video games, computers, internet. We had radio. The whole family would gather ‘round. We had a population of 130 million. 55 million listened to Bing Crosby every week. No play dates. We’d walk over to pals’ yards and yell, “Richard Hill! Jack Jansen! Come on out and play!” And so we did. At home, school, church, we were guided by higher powers. Outdoors, we took care of ourselves. We did a good job. We made it. Here we all are.